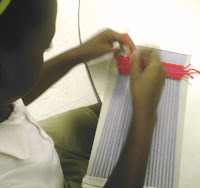 Metropolitan Nashville Public Schools & The Frist Center for the Visual Arts cordially invite you to a reception for the MAYOR’S ART SHOW April 23–May 7, 2009 Featuring artwork from five Metropolitan Nashville Public School Clusters. Frist Center for the Visual Arts Thursday, April 23 5:00–7:00 p.m. Remarks at 6:00 p.m. in the Auditorium $2 parking in Frist Center lots with validation. Space is limited. Free gallery admission. I'll have pictures posted after the show next week! I'm so proud of my student's work. Congratulations to Lynis, Zack, Brilie, Veronica, Daniel, Rowan, Kira, and Natasha for being selected this year!!!! 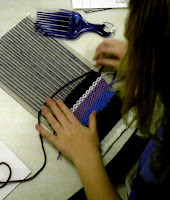 At the end of every school year I do a weaving project with my 4th graders. This project is a blessing in so many ways. #1 THE KIDS LOVE IT!!! #2 BECAUSE THE KIDS LOVE IT...THEY ARE TOTALLY INTO IT AND USUALLY HAVE THE BEST BEHAVIOR OF THE WHOLE YEAR! #3 IT'S SOMETHING THEY REMEMBER & KEEP FOREVER! (I've had students now in high school tell me they still had their's!!!). I didn't tell you the joke I played on one of my students April 1st. I like to joke around with my students year round, and don't usually do anything on April Fools Day...just don't want to model bad behavior!! ha ha However, you have those students that you know you can joke around with...and when the opportunity is right...you go for it!!! So this student missed the day her class recieved their coil pots back. The next time I saw her she asked..."WHEN AM I GOING TO GET MY POT BACK!?!?" I told her if she bothered to show up for class she would already have it, and now would have to wait till the next class time. Everyday till her class came she would ask me.."CAN I HAVE MY POT NOW?!?!" I informed her if she continued to bother me about it..she would not get it back till the end of the school year! When it was her art day(April Fools Day)...she walked in my room, "CAN I HAVE MY POT NOW!" I told her to wait till the end of class & to remind me then. So at the end of class...she reminded me. I went to the clay shelves & saw that I had a pot that looked just like hers that belonged to a student that had moved away. Picking that pot up and walking from behind the shelves...I "trip" and drop the pot..shattering it into a million pieces. Her mouth dropped open...and without missing a beat she says.."I guess you'll have to let me make another now!" ha ha This is a child I knew I could joke with..and that wouldn't start crying!!! I quickly told her it was only a joke..and gave her her real pot!!!! BAD MR.E!!!!!!! !